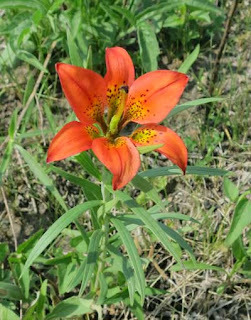 It is not surprising, considering everything else that has happened this spring; I saw my first wood lily (Lilium philadelphicum) in flower a week ago at Black Earth Rettenmund Prairie. A few days later there were about a dozen in flower, in various parts of the prairie. As far as wood lilies are concerned, we are at least three weeks ahead of schedule. 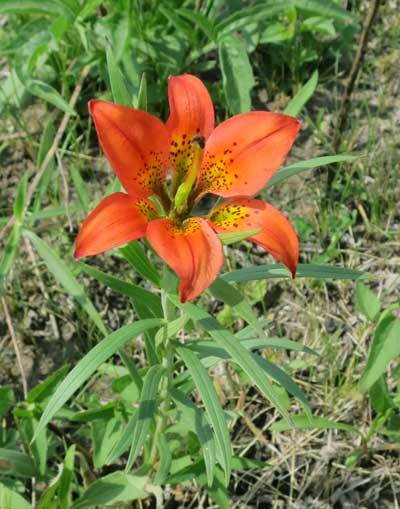 Kathie and I have been conducting a field trip at Rettenmund Prairie for the past 10 years and have always scheduled it for mid June, when the wood lilies are generally at their peak. Sometimes we miss the peak by a few days, but this year we will probably miss it completely. (This year the trip is scheduled for June 21.) Anyone wanting to see wood lilies would be advised to visit within the next week, or in early June! Our field trip should still be worth attending, since everything else will also be early and there should be plenty to see. I saw flower buds on a butterfly milkweed several days ago. This species usually flowers in July! Yesterday our crew plus three volunteers (Kathie, Tom, and Michael) spent most of the day spraying woody plant resprouts in areas at Black Earth Rettenmund Prairie that had been burned this spring. This was an excellent time for this work, as the resprouts were big enough to find but small enough to spot spray. Garlon 3A aqueous was used. The main focus was sumac, gray dogwood, grape, and poison ivy. Although all of these are native, they are all highly invasive and tend to take over. Of these, sumac is the worst. I have done an extensive study on the history of woody plant invasion at Rettenmund, using early TNC and DNR files as well as old air photos and maps. 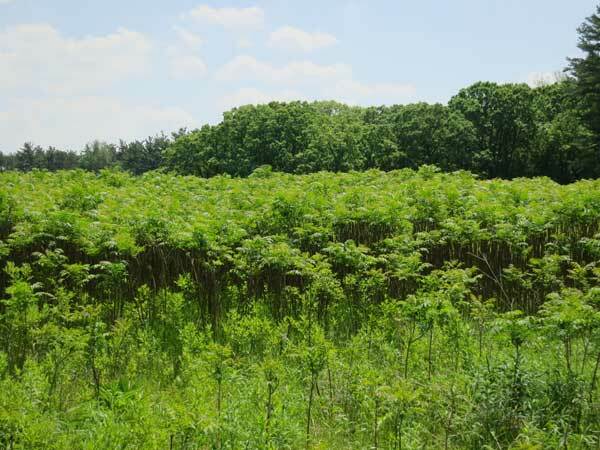 Sumac has been a problem at Rettenmund since the site was first acquired by the Nature Conservancy in 1986. At the time of acquisition the main focus of restoration was on removal of major aspen clones. Knowledge of how to control sumac was limited and control consisted primarily of cutting with brush cutters. However, cutting alone does not eradicate. Each stem has one or more dormant buds that will be activated after cutting. Burning also does not eradicate, although it top-kills. 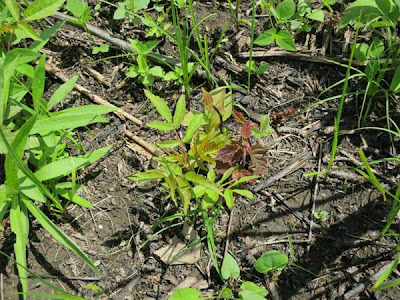 The next growing season after a burn new shoots will appear adjacent to the killed stems. 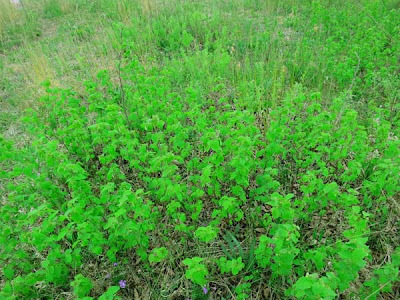 Research has shown that the only way to eradicate sumac is with herbicides and triclopyr (Garlon) is very effective. Either basal bark or cut-and-treat will kill the dormant buds. However, because sumac is rhizomatous, it has an extensive underground network, and killing the stems will induce the rhizomes to send up new shoots throughout the area (root suckers). Thus, to eradicate a clone it is essential to also treat all new shoots that appear. One must return to the site over and over until the rhizome network has been exhausted. This may take several years, but it can be done. It will be necessary to return in a few weeks and canvas the area for missed and newly grown plants. We plan also to return in mid- to late-summer and basal bark any remaining plants. Persistence is the key to eradicating sumac. The details of all of these can be found on previous blog posts. Monitoring sumac-prone areas is important in any control method. Yesterday I spent some time monitoring sumac areas at Black Earth Rettenmund Prairie. These are areas that had been located and mapped in 2010 and 2011 by GPS. They are areas that have had a long history of sumac invasion and hence are targets for present eradication methods. I spent several hours in one burn unit spraying all the resprouts and root suckers that I could find. I plan to return on Tuesday with our regular crew and try to finish the job. It deserves emphasis that frequent prescribed burns are essential for sumac control, as they are for control of other woody vegetation in prairies and savannas. Burns top kill woody vegetation and "set back the clock" so that only small amounts of herbicide are needed to spray resprouts. Burning followed by spraying is the most cost-effective way of controlling brush. If anyone needs convincing, the photo below should help. It was taken Saturday at Curtis Prairie, one of the oldest and most famous prairie restorations in the world. For some reason, this prairie has not been burned lately. Some parts are now almost too late to burn without first doing major brush removal. When brush such as sumac becomes this dense, the grasses that are the principal fuels of prairie burns get shaded out, so that fire will not carry. This prairie is in danger of disappearing! For any area that has been burned, May is a good time for spot spraying resprouts of woody vegetation. Right now we are canvassing our savannas and spraying all resprouts we can find. Resprouts are relatively easy to find, and they are small enough so that herbicide use is low. Also, "good" plants are widely enough separated from resprouts so they won't get sprayed. Some of these are more prolific than others. We have very little buckthorn and honeysuckle, since we mostly eradicated them some years ago. We are getting fairly good control of sumac, although some areas are better than others. Brambles, I fear, will always be a problem, although the big infestations are mostly gone. Canvassing an area takes quite a bit of time. A single person can spend two days on a single 5-acre unit, and use 8-10 Solo backpacks full of herbicide (Garlon 3A; aqueous). Anything that can be sprayed now will not be present later, when it is bigger and requires a lot more effort to control. Resprouts of sumac (Rhus glabra) and hazel side by side. Both can be sprayed with a single spritz. Some species are easier to find than others. Sumac, for instance, with its fine leaves, is harder to find than brambles. 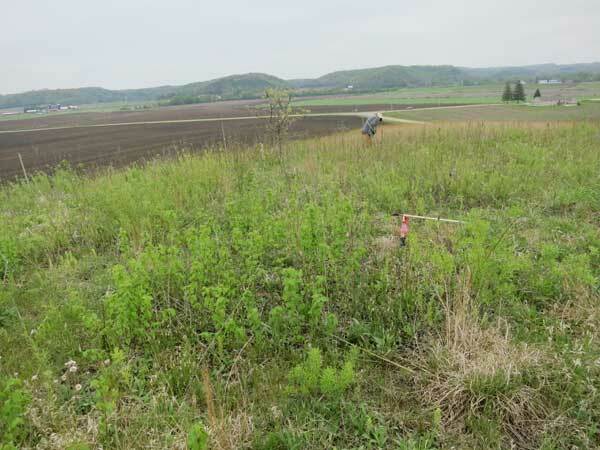 Although Black Earth Rettenmund Prairie is one of the finest prairie remnants in southern Wisconsin, it still suffers from the legacy of past degradation. When restoration was first started in 1986, the site was about half wooded (per my GIS analysis of air photos), and most of the areas that were woody then still provide challenges for restoration. Last Saturday our monthly work party at Rettenmund concentrated on brush control at the knoll on the north unit. In 1986 this was a large clone of aspen. Although all the trees were removed, this area has been one of the most difficult to get restored. The photo here shows what the top of this knoll looked like on Saturday morning. We are using Garlon 4 in bark oil as a basal bark treatment for all these woody invaders. We either use a hand spray bottle directly, or use sponge applicators loaded with herbicide. Some people fastened the sponge applicators to long rods so that they did not have to stoop. Others used a hand-held sponge. In both cases, the herbicide was loaded on to the sponge with a spray bottle. By using the sponge (or a hand spray bottle), you can deftly apply herbicide to a woody stem without harming a nearby prairie plant. Admittedly, this is stoop labor, but at a high quality site such as this, you can't use a backpack sprayer. One of the surprises was the large amount of spreading hazel (Corylus americana) clones. We had seen an occasional hazel bush at this site, but had never seen rhizomatous clones. In fact, many people doubt that hazel is rhizomatous, despite the fact that there are published papers that demonstrate this. Where had these clones come from, and why, for the first time, are we seeing them on the top of the knoll? I counted over 350 separate stems in one clone that I treated. Obviously, we will have to keep on top of this new invader. 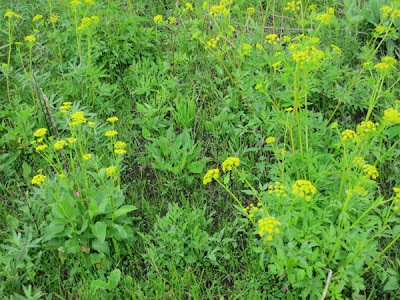 Golden Alexanders (Zizia aurea; C value of 7) is now in full bloom all over southern Wisconsin, providing excellent prairie and savanna color. This is a reliable plant for restorations, as it does well and requires little care. 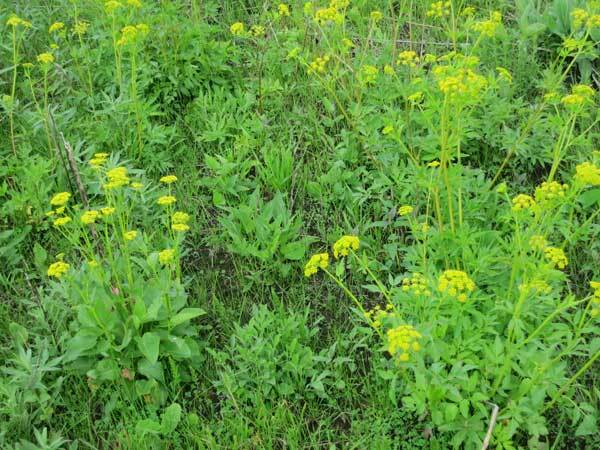 Two species of golden Alexanders growing side by side in the Barn Prairie. 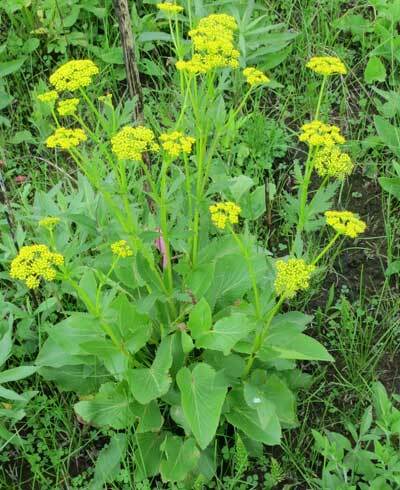 A closely related species is Zizia aptera (heart-leafed golden Alexanders; C value of 9). This is a lot less common in Wisconsin, although I know of one remnant prairie in Dane County where this is the only Zizia species present. We have very little of Z. aptera, and what we do have was brought in as seed, but it seems to slowly becoming established. The photo at the top shows the two species growing side-by-side.We also have a few Z. aptera in the ridge-top savanna. When we were first creating the Barn Prairie we had a lot of trouble with smooth brome and arranged to have the co-op spray it with glyphosate early in the season. The idea was that cool-season grasses (such as smooth brome) would already be up and would be killed, but warm-season grasses and prairie forbs would still be underground and would be unaffected. This mostly worked, but getting the spray timing right is a little tricky. The year we sprayed, tiny shoots of golden Alexanders were already starting to come up, and some of them were set back. In fact, that year we essentially had no golden Alexanders at all. Fortunately, they recovered next year and are now doing very well, as the photo shows. Brambles (Rhus spp.) are not only annoying but incredibly invasive, especially in prairies, savannas, and open woodlands. Seed survival in soil can be very long (at least 100 years for certain species! ), so when the site is opened up by tree or brush removal, expect to start seeing brambles the next year. Bramble control should be an integrated part of any burn program, since brambles are very fire sensitive and are top-killed readily. However, although fire top-kills, it does not eliminate the underground network of rhizomes, and new shoots soon arise from underground buds. 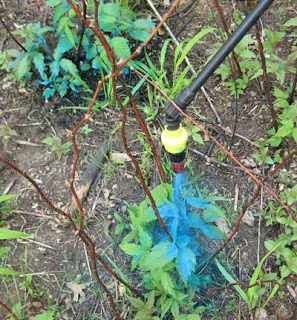 In fact, often fire may appear to stimulate bramble growth, since not only do you get new shoots at the sites of last-year's canes, but from root suckers arising from the underground network. We control brambles by spraying all the resprouts that arise from this underground bramble network. We do a thorough canvas of each area, spraying every new shoot with triclopyr (Garlon 3A at 3.5% aqueous; blue dye added). Last year's canes, usually still visible, can be used to help find the new shoots. It is important to start spraying when the shoots are just up, because the longer you wait, the bigger they get, and the more herbicide they require. In southern Wisconsin, May is generally the best time to spray brambles. However, not all bramble shoots come up at the same time, so to eradicate an area, it must be canvassed at least twice (three times is better). Note that although this post deals with brambles, we spray anything "bad" we find during our canvases. This includes resprouts of other woody species, especially honeysuckle and buckthorn, and the occasional autumn olive, Japanese barberry, etc. Sumac, another woody species that can be controlled by spraying resprouts, comes in early June.